Own Your Beauty: What’s Your Eye Shape? So, you’re thinking about getting a little more serious with makeup? Perhaps you feel that there’s a need to update your look, or maybe you’ve had this awkward on and off relationship with makeup in general and want to figure out what you want. Still, there are loads of questions that you want answered before you start applying the products set before you. Q: How do I know which eye look suits me best for everyday makeup? A: Your eyes are the most difficult area of application when it comes to makeup; therefore, it’s extremely important to know your eye shape. There are four main basic shapes: deep set, partially hooded, mono-lidded, and hooded. 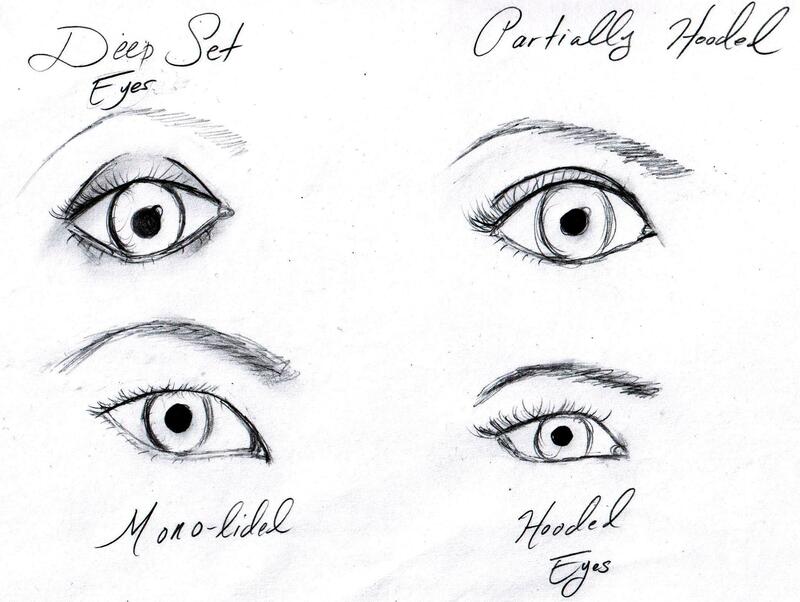 I’ve drawn these eye shapes to the right so you can identify which one you are. crease by blending an eye shadow into the crease and bringing it upwards towards the very tip of your eyebrow. This will lift your eye upwards and take the pressure off how deep your lids are. 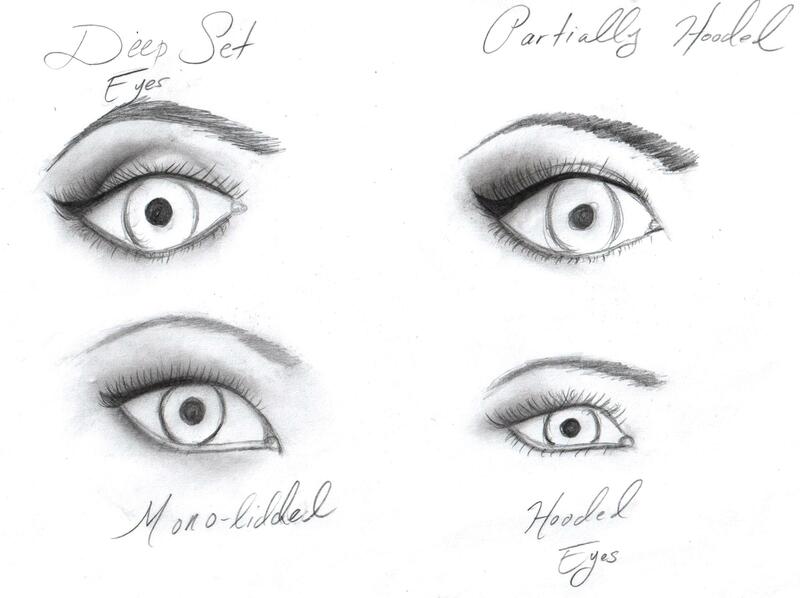 There are many different ways you can do makeup with this eye type. However, because the crease does not follow all the way through it can sometimes make the eye look droopy towards on the outer corner, which is why adding a little bit of eyes shadow on the outer corner and blending it upwards will deepen the look of the outer corner lashes and bring that eye up. With this eye shape, it looks lovely when you utilize eye shadow to trick the eye into making the upper lashes look more thick and voluminous. By doing this you give depth and dimension to the eye. Also, by bringing the eye shadow down on the bottom lash line and blending it out you can give the eye a rounder shape. This eye shape is very similar to the mono-lidded shape, however with this type of eye, the upper lid area is nearly resting on the eyelashes (this can be natural or due to aging over time). Because the upper eyelid protrudes a bit, we want to push it back and lift the eye upwards. To do this, use a neutral colored eye shadow on the outer corner of the lid and blend it upwards lightly. Q: Are there strict boundaries separating day makeup and night makeup? Honestly, I don’t think so. Generally, during the day you want to wear lighter makeup because it’s typically the makeup you’re going to be wearing all day (you don’t want to suffocate yourself). Also, lighter makeup looks more natural on your skin with the sun shining all around you. But I say, if you want to go for a bolder eye on a Wednesday morning—go for it! Q: Where should I turn for inspiration? 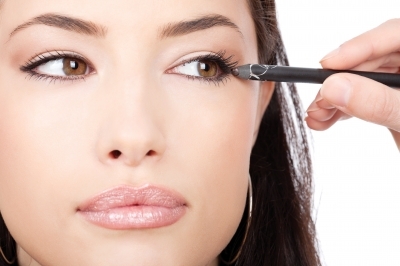 There are two things you should do here: take a look at various makeup looks on the web. Perhaps you’ll find one that you’d like to replicate. Secondly, go outside and take a look at nature. For some reason nature has the right idea when it comes to color combinations and interesting designs. Q: How do I know if I’m wearing too much face makeup? This is a huge mistake I see a lot of gals do, and it’s usually because of the lighting they use to apply their makeup. Always try to use natural light, if it’s night time go with a light that is white like an LED or a CFL light bulb. Then you will truly be able to see the amount of makeup you’re applying on your skin. Q: I have extremely sensitive skin, how do I test out a product so I don’t have a reaction on my entire face? There are two places that you can test a product before putting it all over your face: 1) your inner elbow area and 2) right under your chin. Simply apply a dot, rub it in to the skin, and repeat for a week. By the end of the week you should be able to tell if you’re reacting to it. Q: How do I match my foundation to my skin tone? There’s a horrible myth going around saying that you can match your foundation by applying into the inner part of your arm, but please do not do this. Match your foundation color to your neck and chest area. Always bring your foundation down your neck to match with your chest, or you will end up with very visible line broadcasting that you’re wearing foundation. I hope that these questions and answers were of use to you all! Work with what you’ve got; all eye shapes are lovely in their own ways, so accentuate your natural beauty. Previous Post: « Can You Afford a Sailboat?